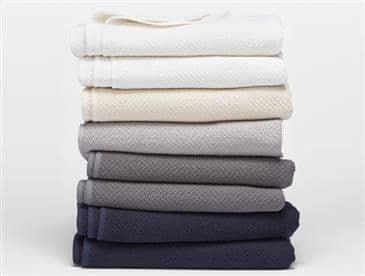 Honeycomb Organic Cotton Blanket by Coyuchi, USA. Order with Free Shipping ! Soft yet substantial, durable and pet-friendly, this Honeycomb Blanket is perfect for any season and now Fair Trade Certified™ Factory—just one more reason to love this customer favorite. Its chunky jacquard weave lends it weight and texture and locks in warmth. Made of pure organic cotton, it’s pre-shrunk to retain its shape, year after year and wash after wash. Piece dyeing creates variations in color that make each piece unique. Available in three sizes and four colors, each neatly bound in dyed-to-match percale.